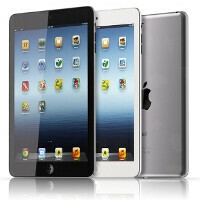 Apple is reportedly tapping Taiwan's AU Optronics for the display on this year's iPad mini edition. Some of the 7.9" tablet units are now equipped with AUO's AH-VA screens as well, but Apple also sources panels from other suppliers for its affordable slate. Rumors abound that the 2013 iPad mini will feature a high-resolution screen, though the exact pixel density speculation is contradictory. Alternatively, Apple might just bump the resolution a bit without resorting to the Retina Display moniker, as there are many other areas it can tout as improvements in the iPad mini, such as a new design and a faster processor. anyone knows which month is it going to be released? want to buy original iPad mini but waiting for price to go down as £270 is way overpriced to me. I know the new iPad mini will push price of old one down.